Maybe you are a new computer user, or perhaps you have never placed your own holds using our on-line catalogue. These basic instructions will help you. Our new catalogue is very user friendly and fun to use. To begin go to our website www.valleylibrary.ca. Remember to make sure you are using an updated browser. Find our more HERE. Once there, find the empty search box in the upper right hand side. Using your mouse, click on the Catalogue button to highlight it so that you will only be searching our catalogue. Now type a topic in the search box and click on Search. I have chosen the topic gardening for this exercise. Next you will get your search results. For this subject there are 871 titles. You will notice on the right side of this page a box with related topic searches that will be like a shortcut to the information you are looking for. Or you can have fun scrolling down and through the results to see what we have available. I have chosen flower gardening in the shortcut list. Now the search has been narrowed to flower gardening and this next page will show you only those results. Enjoy scrolling through these results. If you see a title that you would like more information on, just click on the blue title. This will take you to a page on this specific title with more information including a look inside. If this isn’t a book you wish to read, click on the Go Back arrow in the burgundy line near the top of this page. Keep scrolling through the results until you find an item you would like to borrow. When you do, click on Place Hold. On the next screen you will need to enter your Annapolis Valley Regional Library Card number and your PIN number. If you don’t know your PIN please call our office at 902-665-2995 for help. Then you will be asked for a pickup location from the drop down menu. Click on the branch you would like this item sent to for you to pick up. No matter where you are in the Valley, we can send the item to your local branch. Now click on Place Hold. Congratulations! You did it. Repeat this process for each item that you would like to borrow. A word of wisdom though, this can be addictive and you may find all of your holds arriving at the same time. Look for another blog at a later date on managing your holds and your account. Make sure that you log out of your account once you have finished placing holds. Simply click on the words Log Out in the upper right hand corner of the screen that will appear to confirm your last placed hold. Now wasn’t that easy? The item you have placed a hold on will be sent to the branch you chose when it becomes available. Sometimes there is a list of other people waiting for the same book and so you will also need to wait your turn. But at least your name is now on that list. Welcome to the world of browsing our online catalogue! Look for our new online catalogue within the next few months. The look will be different however; the procedure will be the same. What do you really know about Epilepsy? Many of us have a picture in our mind of someone having an uncontrollable “fit”. While seizures are a symptom the type and frequency are varied. This is a neurological disorder which presents itself in many forms. It is unfortunate that the mere word Epilepsy still carries such a stigma that it causes many sufferers to hide their condition when just a little education would work wonders in understanding what having Epilepsy really means. On March 26th, 2015 people around the world will be wearing purple to raise awareness of Epilepsy. Fund raising events, testimonials, rallys and other events will be held. It all began with Nova Scotian Cassidy Megan who created the idea of Purple Day in 2008 when she was 8 years old. Motivated by her own struggles with epilepsy her goal was to get people talking about epilepsy in an effort to dispel myths and inform those with seizures that they are not alone. The Epilepsy Association came on board the next year and now it is world wide. Check out her Purple Day blog. Right now there are 300,000 Canadians living with Epilepsy. Find out the basic facts, for example it is not a disease and it is not contagious (two very common myths). Check out the informational downloads available through the Epilepsy Canada site. Familiarize yourself with the simple First Aid rules pictured and don’t forget to wear purple on March 26th !! We are working on something really fun here at AVRL. They are called "Be Fit" Physical Literacy Kits. We all know how important it is for kids to have access to books and language at an early age, but sometimes we might forget how important it is for kids to be active, even as toddlers or infants. To make this easier for families, we've partnered with Sport Nova Scotia and Valley Active Living to create kits that you can take home and play with! Each kit contains fun items such as balls, juggling scarves, activity dice, frisbees, skipping ropes, and more! There's an activity booklet included in each one that guides you in ways to use the items included. We've even included 4 picture books that will get you moving as you read together. The kits will be ready soon, so keep an eye out! We've already been playing ball in the office, so we know you are going to have fun with these. Our first official launch is in Berwick on Saturday, April 4. We'll have the kits there for you to test out, show you some games to play with them, and we'll also have healthy snacks and door prizes, so come see us then! More launches will be scheduled -- one at our Windsor branch and one in Annapolis County, so everyone has a chance to come play! Once they are ready, you'll be able to check one out for 3 weeks, and use it at home, for parties, or take it camping. Wouldn't it be fun to have an Active Play birthday party? Preschools and daycares could borrow them for a Fun Day. The possibilities are endless! And there's no charge to borrow one. We'll have them ready by April 4, so start thinking of how you will use a Be Fit Kit! March Break is just around the corner. But don’t panic if you haven’t got your week filled—we have some great programs happening right here in the Valley. And guess what? They are FREE! That’s right, your local library has cooked up a great slate of programs for all ages. LEGO-loving kids will want to head over to the Bridgetown, Kentville, and Windsor libraries this week. We have lots of our own LEGO, so stop in and see what you can build with ours. And in both Berwick and Bridgetown, there are LEGO robotics programs during March Break, and a LEGO stop-motion film program in Berwick. And if you have tons of LEGO at home, try some of these LEGO challenges on our Pinterest board. There are storytimes in Berwick, Bridgetown, Kentville, Port Williams, and Wolfville next week. And if you like art, there’s an Art Lab in Kentville and a program with the Firefly Makery in Bridgetown. For ages 10-16, there’s Art attack in Port Williams. They are making monster toys over in Berwick and painting flower pots in Kingston. For ages 10+, there are some great programs, including drumming workshops with Kadijah in Berwick, Bridgetown, Hantsport, Lawrencetown, and Wolfville. Sign up because space is limited for these programs. Girls ages 10-15 should check out GirlPower in Berwick and Wolfville. There’s even a Camp Out in Middleton, with lots of food & fun. Bring your sleeping bag! And if you like robotics, stop in our Middleton branch to test drive some new toys we just got. (Maybe you can show us how they work.) And if you have some studying to catch up on, or want to be super-smart when you get back to class, use Tutor.com to help you get back on track. Open every day from 3 pm - midnight, and free with your library card. In Kentville you can go see Al Bernard or learn to knit. In Berwick you can learn cartooning with Mark Oakley. Stop by Middleton to explore one of our Early Literacy iPads. Attend a Computer Camp in Lawrencetown. There’s so much to do! 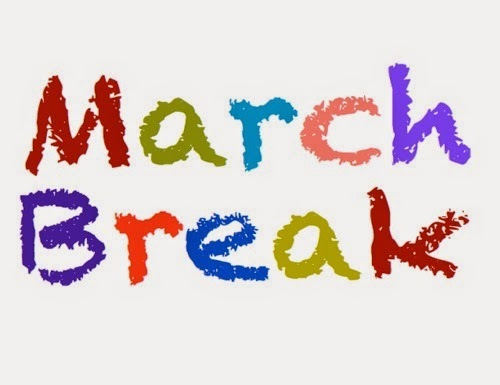 Just click on THIS LINK for our March Break programs. You can sign up online or by calling the library. Adults, don’t fret: there are even programs for you. In Annapolis Royal the Speaker Series is back. And in Windsor, meet at the library all week long for Canada Reads. Sign up for a computer tutorial or a workshop. And of course we’ve got plenty of books and DVDs to occupy your time. Grab a whole stack of both and keep the “I’m Boreds” at bay. See you at the library! Hello fellow readers! I know that many a stormy night this winter I have enjoyed curling up with a good library book. This winter of heavy snows and unpredictable weather has lead many of us to enjoy our library books even more than usual. Now just imagine that you have the winter blahs, you love to read AND you are print disabled. Imagine that you can’t hold a book properly, or you can’t see the print in your favourite book anymore. This winter would be even more tiresome under those circumstances wouldn’t it? This is what our print disabled patrons face every day. This is why the Annapolis Valley Regional Library has a Special Needs Service to help talking book users to enjoy their favourite books. The problem is, if they have an older cd/mp3 machine that does not play the newer formats and they can’t afford to purchase a new machine, their audiobook options are limited. There is a wonderful but expensive machine called a daisy player. 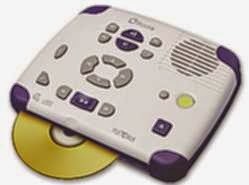 It plays all the new formats and is very easy to use with large buttons and simple instructions. These are like the Mercedes Benz of audio players. Here's what one type of daisy player looks like. Most talking book users can’t afford the expense of one of these wonderful machines because they are several hundred dollars. There are some families who may have a player that is no longer being used. We would love it if they could donate this item to AVRL. AVRL will give you a tax receipt for up to half of what the player cost you when new. You can rest assured that you are bringing happiness and enjoyment to many AVRL print disabled users who want to be cozy and enjoy a good book on a stormy day! Even if you don’t have a player to donate you can pass along this information to someone who does have one. Or, if you would like to make a cash donation towards one of these players, that is also an option.